Situated along the James River, thriving as an independent city since 1871, is the city of Richmond, Virginia. Richmond is approximately 44 miles west of Williamsburg, east of Charlottesville by 66 miles, and south of Washington DC by about 98 miles. 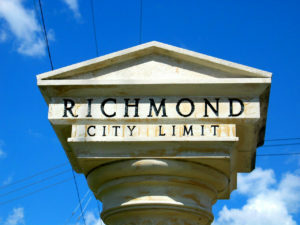 Richmond is the Commonwealth of Virginia’s capital. Richmond, Virginia is home to a population of around 217,853. Residents enjoy annual household incomes of around $39,906. Houses in the area hold average values of around $199,900, below the state average home values of $257,800. Historic landmarks, building, and districts pepper the city which is steeped in rich history. The city also maintains more than 1,500 acres of parks. The area is also a fertile ground for big business, arts and culture, visual and performing arts, as well as literary arts. Surrounded by Henrico and Chesterfield Counties, students living in Richmond attend the Richmond Public School District. Richmond schools include 28 elementary schools, nine middle schools, eight high schools, and a total of 24,000 students each year. Richmond also offers dozens of charter schools and private schools throughout the area. There’s no problem accessing transportation in Richmond, Virginia. Air travelers depart from and arrive at the Richmond International Airport. The area is a major hub for greyhound lines, and also offers Amtrak passenger rail service. Public bus routes are serviced by the GRTC, the Greater Richmond Transit Company. Richmond receives around 44 inches of rain per year and around 11 inches of snow, spanning 74 days annually with measurable precipitation. However, the sun shines on Richmond 210 days out of the year. Summer high temperatures average 89 degrees while winter lows drop below freezing to around 26 degrees. In Richmond, Virginia, there are plenty of things to do. Choose from a plethora of restaurants, ethnic menus, and dining styles. Visit the museums or galleries, hang out at the local parks, explore the shops, and find out why Richmond, Virginia may be the ideal place for you to hang your hat and call home. Your real estate agent is the best source of information about the local community and real estate topics. Give The Wilson Group a call today at 888-706-0170 to learn more about local areas, discuss selling a house, or tour available homes for sale.